It had already been a long day. The tension – as if he had a lump of cold lead in the very bottom of his stomach – started with a phone call from Group Headquarters, telling him that the squadron was ‘on’ tonight. No matter how many times he’d done this, that lump of lead was always there. It sat in the background during the scramble to work out how many aeroplanes his Flight could offer for the coming operation, and through the endless meetings and conferences to thrash out tactics, and in a way he was grateful that he’d been so busy: it took his mind off what he’d be doing, where he’d be going, when the sun went down. But despite the distraction, the lump of lead grew larger as the day went on: by the time he’d been to the briefing, eaten the ‘Last Supper’ of eggs and bacon, pulled on his flying gear and climbed into the truck that took them to their aeroplane, it must have weighed half a pound at least. 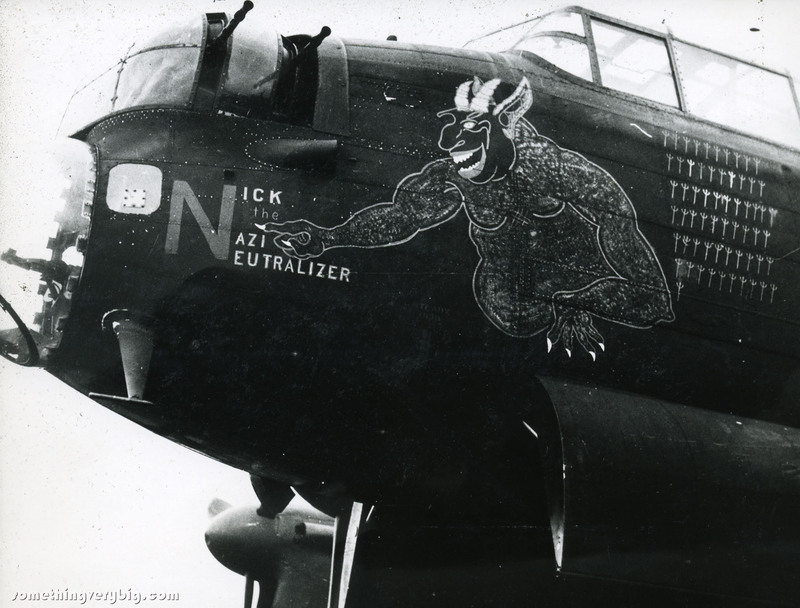 And then the wait, that endless, awful wait, sprawled on the grass next to the bomber: forced jokes, nervous laughter, cigarettes lit with shaking hands, with nothing to do except think about the coming operation. In that hour, the ball of lead in his stomach felt like it doubled in size. But then he’d climbed up the ladder and into the aeroplane. Walked, crouching, up the angled fuselage. Scrambled over the main spar. 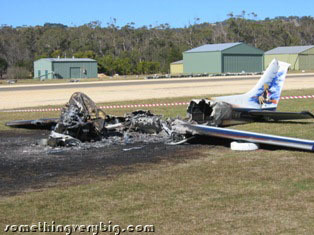 Strapped himself into his seat and started the engines. Everything that had happened today – the conferences, the briefing, the truck to dispersal – had been preparing for this moment. 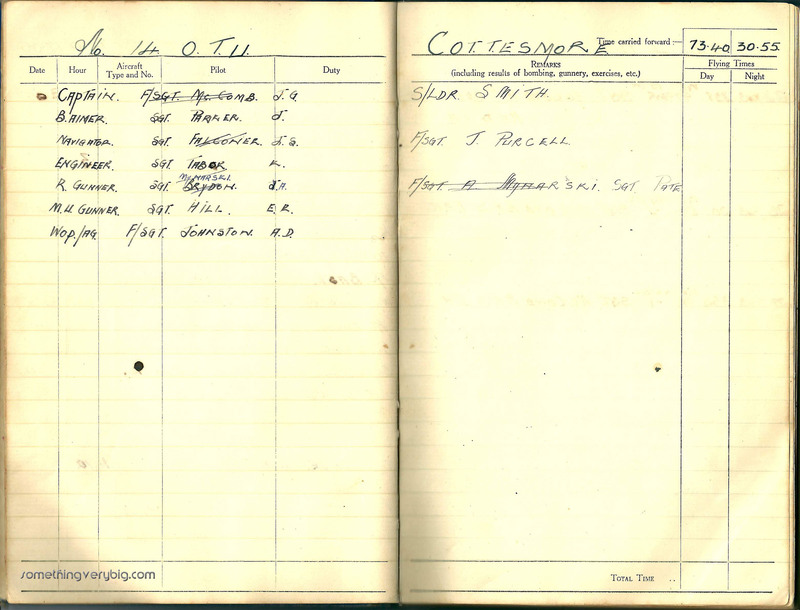 The armourers who loaded the bombs, the fitters who tuned the engines, the airmen who filled the fuel tanks, all had been working to a timetable based on this: the moment the aeroplanes started rolling and the raid began. Phil had flicked off an aeroplane’s brakes for a raid many times before. Fifty times, to be precise. And that fact meant that this was the last time he would have to do it. This trip – a short one, they’d said at briefing, just three hours return, a piece of cake really – was the last one of his second tour of operations. After that, he knew, he could no longer be compelled to do any more. He’d be posted to a training school for another stint of instructing, perhaps. Or maybe he’d be given a staff job somewhere. Maybe he’d even be sent home to Australia. That might be nice, he thought. It had been more than three years, after all. But there was his crew to think about, too. They were all still on their first tours and most of them still had about ten trips to fly before they were done. If Phil finished tonight, he knew they’d all have to keep going without him. That meant they’d have a new pilot to get used to, a less-experienced man most likely, and it would take time before they were as efficient a unit as he knew they now were. 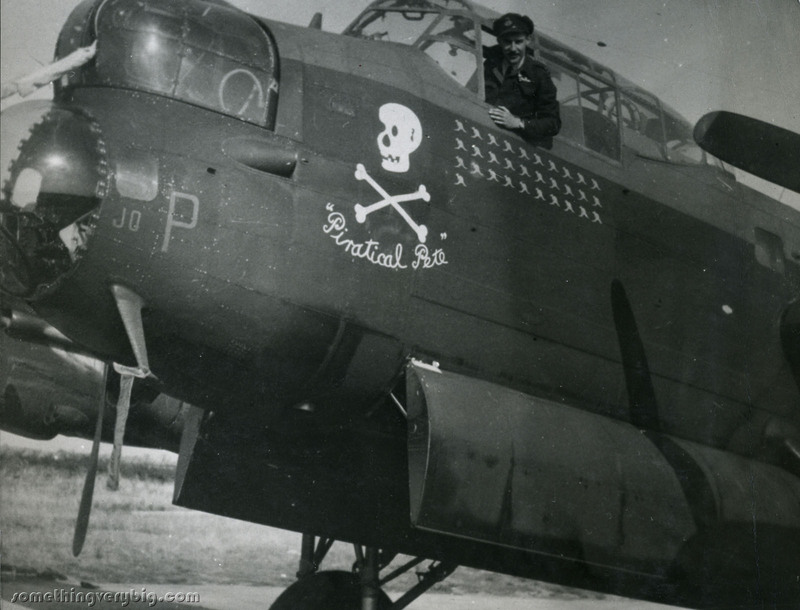 Survival on bombers was at least as much about luck as anything the crew themselves brought to the table, but they at least felt that they could favourably influence their chances if they were as effective and careful as they could be. Having to deal with an unfamiliar pilot could be just enough to tip the delicate balance from surviving to not. Despite having more than done his bit for the war effort, Phil was in two minds about whether he was prepared to make the rest of the crew take that chance. 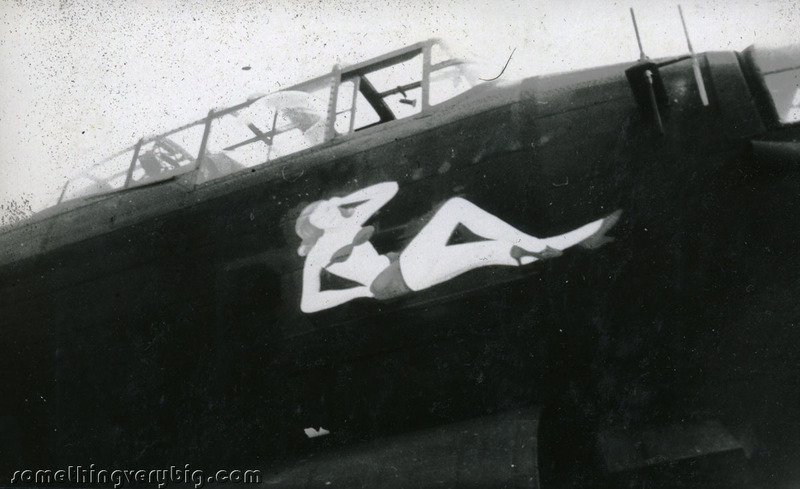 Just Jane to fly again? Twenty miles east of Lincoln lies a small village called East Kirkby. In fields nearby are the remains of a Royal Air Force Bomber Command station of the same name. It would be just one of many similar old airfields liberally scattered around Lincolnshire, except that in a corner of this one is the Lincolnshire Aviation Heritage Centre – the home of Avro Lancaster NX611, better known as Just Jane. 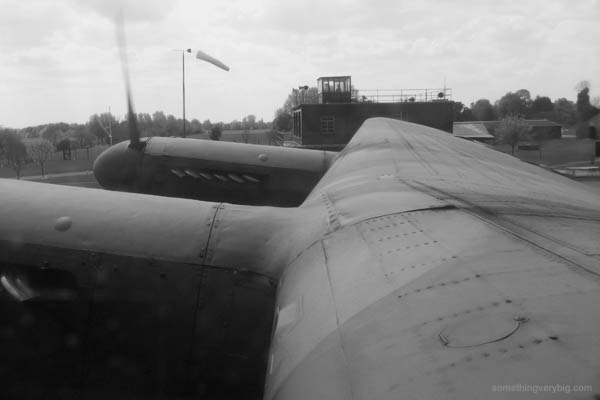 I went on a taxi run on Jane during my Bomber Command ‘pilgrimage’ to the UK in April 2009. It was undoubtedly one of the highlights of my trip. Sitting in the wireless operator’s seat (while the desk is still there, the navigator’s seat has been removed), feeling the vibrations as the aircraft moved and hearing the roar of the engines and the hiss of pneumatic brakes as we bumped our way around a small part of the old airfield, it was very easy to close my eyes and feel just a small taste of What It Was Like. There has been some significant press coverage in the last couple of weeks about a possible restoration to airworthiness for Just Jane. Indeed, a report on BBC News was reportedly the most viewed and most shared video on the website the day it was released. The museum has secured four airworthy Merlin engines and is slowly gathering more parts, including an almost complete Martin mid-upper turret. Certainly it would appear that the Panton brothers are serious about getting their treasure into the air again. 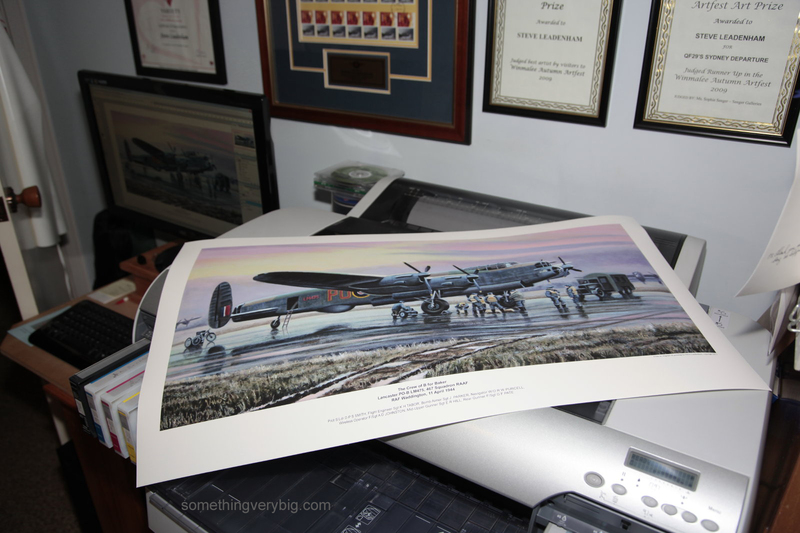 But restoring another Lancaster to flying status will be a significant challenge. 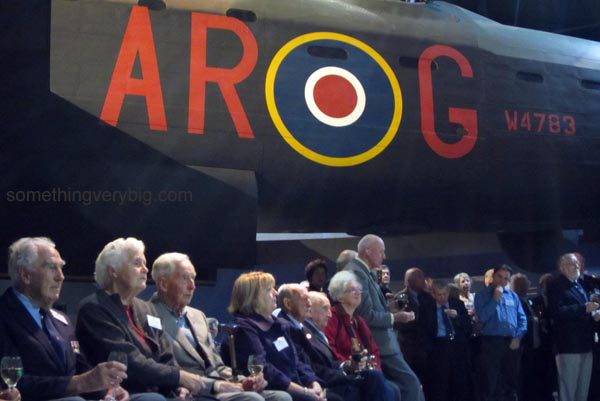 It took a decade to get Canadian Warplane Heritage’s Mynarski Lancaster airworthy. Just Jane is in quite good condition but there are far more regulations and requirements surrounding an airworthy aircraft than those relevant to one that stays on the ground – maintenance becomes instantly more expensive as it would need to be signed off by a licensed engineer, for example. The Pantons are reportedly planning to carry out the restoration on site at East Kirkby. As I discovered when I visited in 2009, they do already have some heroic if limited restoration work already underway on projects like a Hampden light bomber, but a Lancaster – to flying status – is in a whole new level of complexity. Obstacles like these can be overcome, given sufficient determination, but they also need piles and piles of cold hard cash. Taxi rides on Just Jane are by far the biggest attraction of the Lincolnshire Aviation Heritage Centre, and with Jane inaccessible for two seasons at the very least, that’s a large proportion of their revenue affected. I don’t know the full story, and it is entirely possible (even likely, given the increase in news coverage recently) that the museum has planned and saved already towards the restoration. There are a number of static Lancasters around the world so I feel the risk of losing one in a crash, while very real, is not a reason to leave it on the ground – after all, an aeroplane’s natural environment is the sky. But there is another perhaps more philosophical reason that I think should be considered before any work is commenced. At the moment, Just Jane provides the only opportunity in the world for members of the general public to crawl all over a Lancaster in something close to wartime configuration. Following the taxi run, you are given the complete run of the machine – sitting in each crew position (though the mid-upper turret is at the moment a shell only), clambering over the main spar, handling the bomb sight and of course manipulating the flying controls in the pilot’s seat. The point is that once the aircraft is certified for flight, it will need to comply with civil aviation regulations and as such this freedom will necessarily need to be curtailed. And having gone to the trouble and expense of returning the Lancaster to flying condition, it’s debatable whether the museum would then tolerate the additional cost and wear and tear of public ground runs. As current EU regulations stand, flying paying passengers on the aircraft would be nearly impossible (inflexible security laws introduced in 2008 mandate things like bulletproof cockpit doors and escape slides in large aircraft carrying paying passengers, requirements that are impossible or at least extremely impracticable for vintage aircraft of this nature). And about 20 miles down the road is the RAF Battle of Britain Memorial Flight, with its own flying Lancaster, so people can already see one of the old bombers flying on a regular basis. 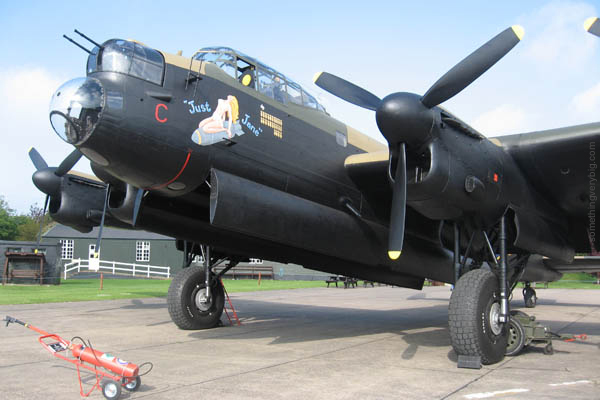 If Just Jane does ever fly again, the very accessible opportunity for members of the public to experience being in a Lancaster with its engines running will probably be lost. As good as it would be to see two Lancasters in the air at once, I feel that, rather than simply watching another aeroplane fly past, experiencing one of Just Jane’s taxi rides is a far more effective way to give modern audiences a personal feeling of What It Was Like. Which, for people like me, is the whole point of the exercise. There was an old man sitting patiently in the departure lounge in Melbourne when I boarded a QantasLink Dash 8 to fly to Canberra last weekend. Sat next to him was his middle-aged son. When we boarded the aircraft they sat across the aisle and a few rows in front of me. I overheard a snippet of half a conversation that the younger man was having on his phone: “meeting in Canberra… taking him to… you know, Air Force stuff…” I watched his father as we powered down Runway 34 and took off. He was gazing out of the window, and his thoughts looked like they were miles away: across the seas, and across the decades. 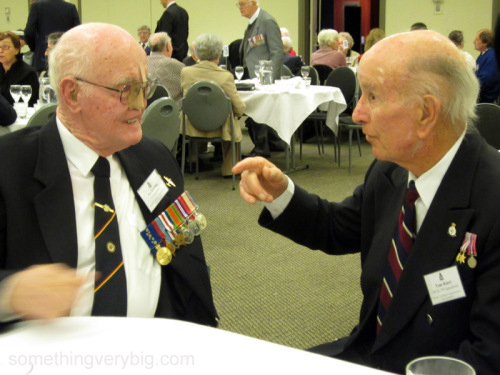 They were going to Canberra for the same reason I was: the fourth annual Bomber Command Commemorative Day. I next saw Ian and his son Phillip underneath the nose of Lancaster G for George at the Meet & Greet cocktail party later that evening and went across and said g’day. 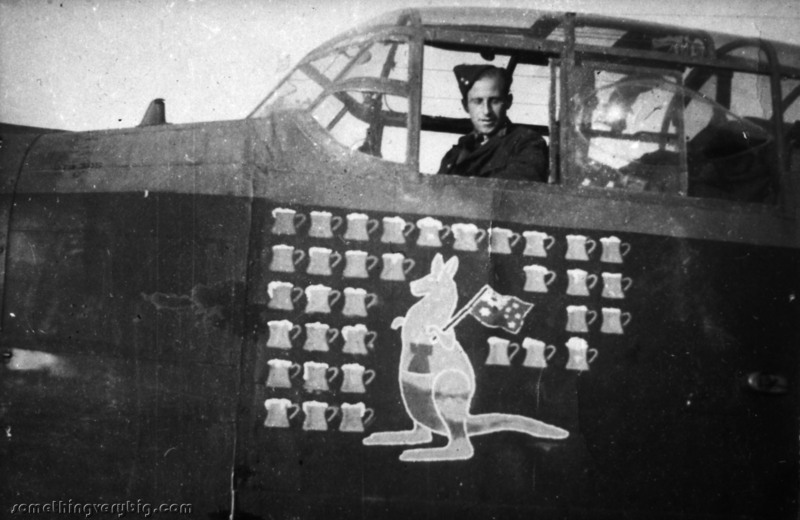 Ian had been a 460 Squadron pilot so it was fitting that G for George, a 460 Squadron machine, was the centerpiece of the function. It was an outstanding evening. There were perhaps 150 people present, a fair proportion of those being veterans. Talking about flying Lancasters with people like Don Huxtable, a 463 Sqn skipper, was a unique experience as he casually threw a thumb over his shoulder at the old bomber to emphasize a point. The function ended with the magnificent ‘Striking by Night’ sound and light show recreating a bombing raid around the Lancaster. We retired to the hotel bar for a nightcap, ensconced in a warm corner while Don Southwell held court. It was a cold and misty Canberra winter’s morning when we awoke. But the sky soon cleared and the sun was nicely warming as we took our seats for the ceremony at the Australian War Memorial. As is customary the AWM Ceremonies division put on a good show. It ran smoothly and Don Browning’s ‘Reflections’ presentation was particularly good. As the first notes of The Last Post rang out into a brilliant blue sky the line of young RAAF officers in the row in front of us snapped into a salute. It was a moving moment. 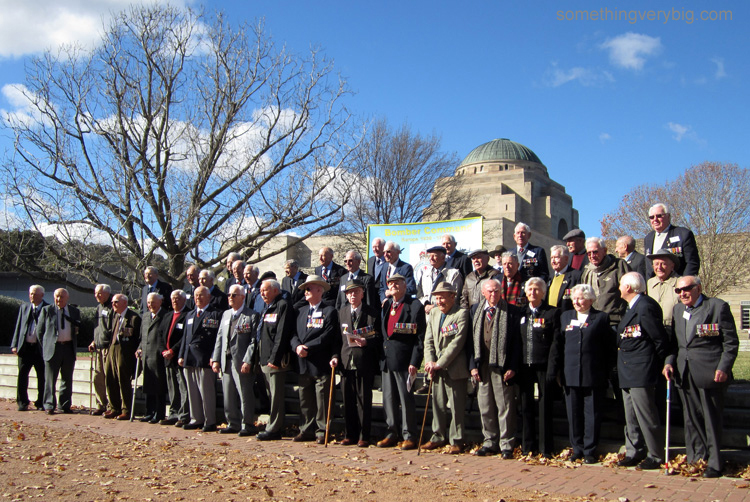 After the ceremony all the veterans moved up towards the War Memorial buildings for an extraordinary group photo. I counted 50 veterans, surely one of the largest gatherings of Bomber Command airmen (and at least one WAAF) anywhere in the world these days. The final part of the weekend was the luncheon. This was, I reckon, the highlight of an already highlight-heavy weekend. Some 200 people showed up, with at least one veteran at each table. The other man is Pat Kerrins, a pilot from 115 Squadron. They were in animated conversation regarding a mutual friend and just being a fly on the wall while they chatted away was fascinating. A copy of this photo will be winging its way to each of these men shortly. I also met Jean Smith, who served in the WAAF at 27 OTU, RAF Lichfield, and a couple of likely suspects involved with the 463-467 Squadron Association in Melbourne. All very interesting people to know. 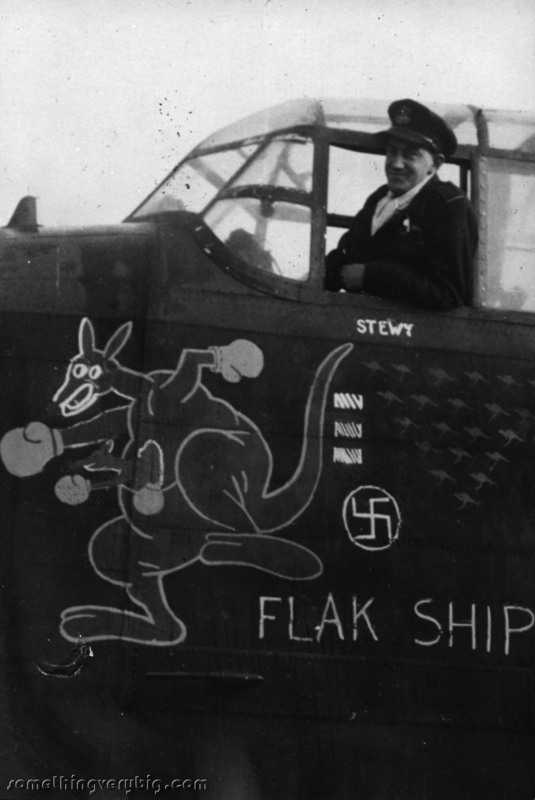 This has become an extremely significant event in the Bomber Command calendar in Australia. 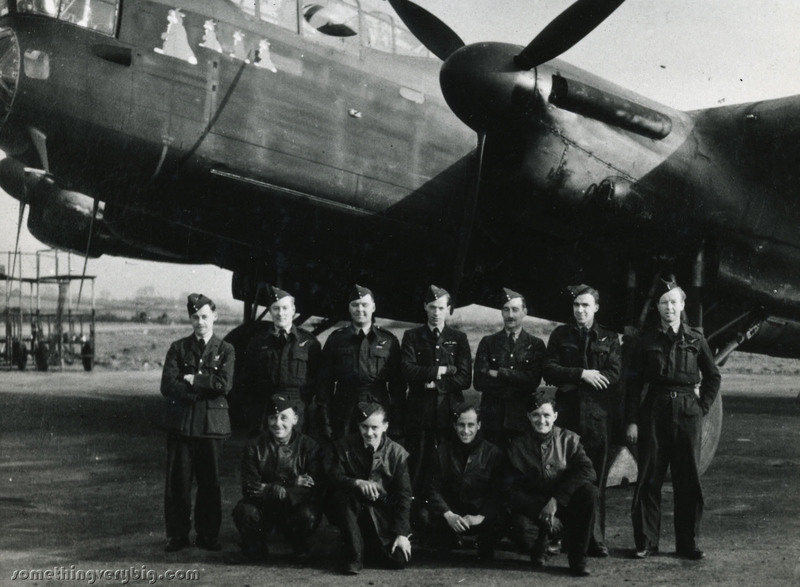 The Bomber Command Commemoration Day Foundation was set up to organise events like these to ensure that the men and women of Bomber Command get some long-deserved recognition. 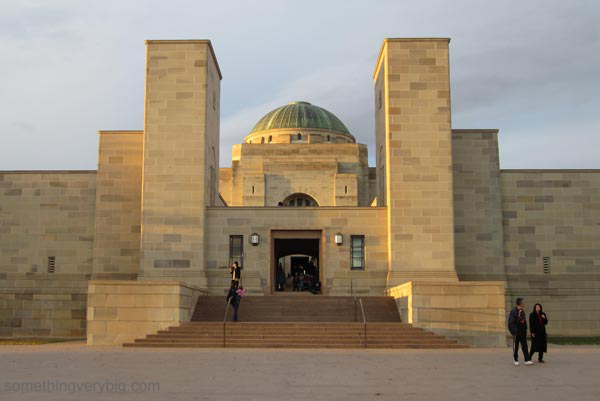 Behind ANZAC Day and Remembrance Day, this is now the third largest single event held by the Australian War Memorial each year. Given the level of interest in this year’s event, the men and women of Bomber Command can rest assured that it will continue into perpetuity. The crew of LM475 B for Baker, an Avro Lancaster Mk III of 467 Squadron, Royal Australian Air Force, arrive on dispersal at RAF Waddington on the evening of 11 April 1944. Their target is Aachen in Germany. 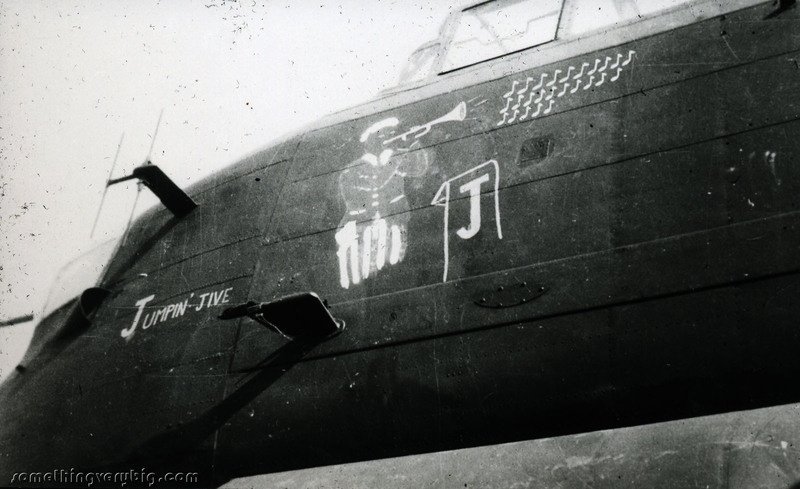 The crew is made up of seven men: Pilot S/L DPS Smith, Navigator W/O RW Purcell, Flight Engineer Sgt KH Tabor, Bomb Aimer Sgt J Parker, Wireless Operator F/Sgt AD Johnston, Mid-Upper Gunner Sgt ER Hill and Rear Gunner F/Sgt GF Pate. One month after the Aachen raid, B for Baker failed to return from an operation to Lille, France. Of these seven men, only the pilot would survive. This painting, by aviation artist Steve Leadenham, was specially commissioned by Adam Purcell, the great nephew of the navigator. It serves as a tribute to these seven men – but also to the 125,000 who also served in Bomber Command during WWII. The story of how this project developed can be read in the archives of SomethingVeryBig. Click here. High-quality 80x40cm archival reproductions of this painting are now available for purchase direct from the artist at the rate of AUD45.00, plus postage to anywhere in the world. For details on how you can obtain your own copy of this very special image, contact Steve directly through his website: http://leadenham.com/contact.html. See more of Steve’s work at www.leadenham.com. 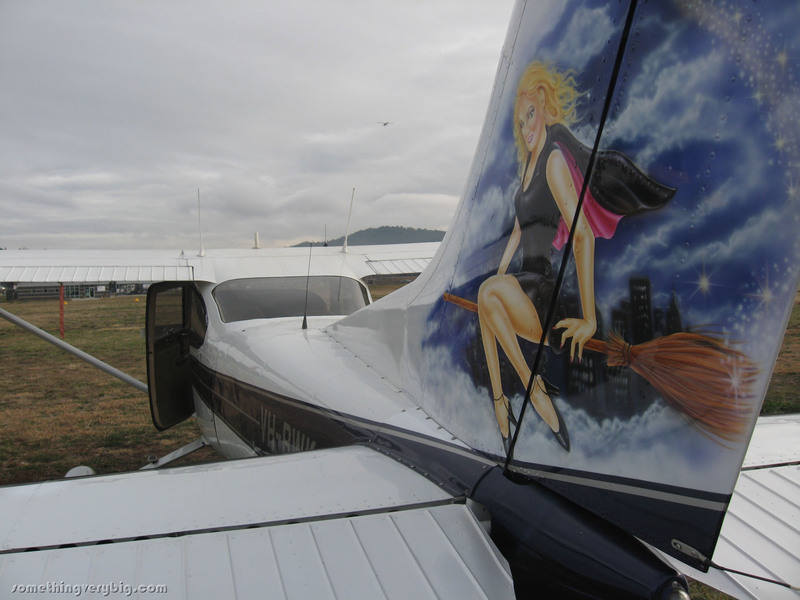 My good friend Joss le Clercq is a French aviation historian of some note. When I visited Lezennes and the graves of my great uncle’s crew in 2009, I stayed for a few nights with him in his farmhouse between Fromelles and Aubers, about 20km west of Lille. Joss has the beginnings of a small aviation museum in his back shed. There are parts of many crashed aeroplanes, all dug up around the local area. Among them is one particular bit of metal. 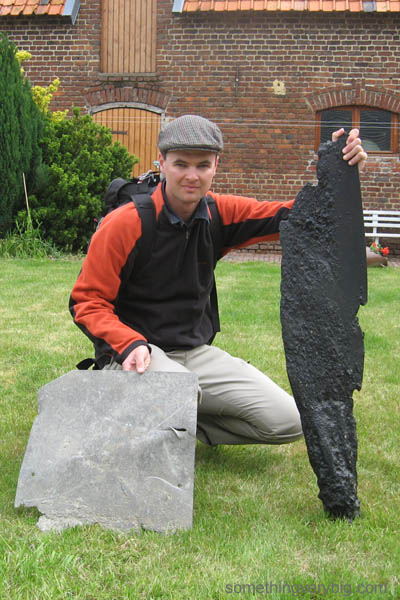 Though badly corroded, it is still unmistakably a fragment of a blade from an aircraft propeller. 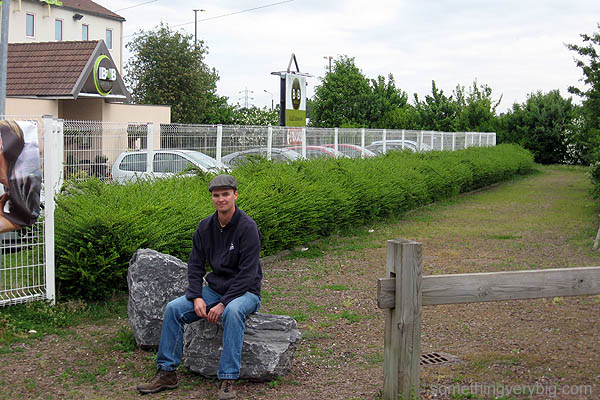 About fifteen years ago, a hotel and a petrol station was being built in Lezennes. While digging the foundations they found some rusted metal – which Joss identified as the remains of a Lancaster. He retrieved two pieces – the propeller blade and a flat fragment of alloy. From local records he deduced which Lancaster the wreckage was from. Of the crash site itself there remains now virtually no trace. The petrol station continues dispensing liquefied dead dinosaurs in its curiously French, completely automatic way. The hotel looked pretty empty when we visited. But there are two large rocks on a small bit of flat ground, which Joss says are pretty close to where he found the propeller blade a decade and a half ago. I reckon they look ideal for the placing of a small plaque, to mark the spot where the Lancaster came down. A task, perhaps, for when next I visit.